Out of the box WordPress isn’t particularly Search engine friendly, but fortunately it is a relatively easy problem to fix by following some basic SEO practices. All pages have meaningful page names. All Pages have at least one incoming link (internal or external) so that the search engines can find them. This can be accomplished in 5 simple Steps. Change default permalink structure to use the post name only. Remove the blog title and blog tagline from the pages. Install and setup The All in one SEO plugin. Make sure each page/post has a unique page title and description. Pay Attention to Your Internal Linking. 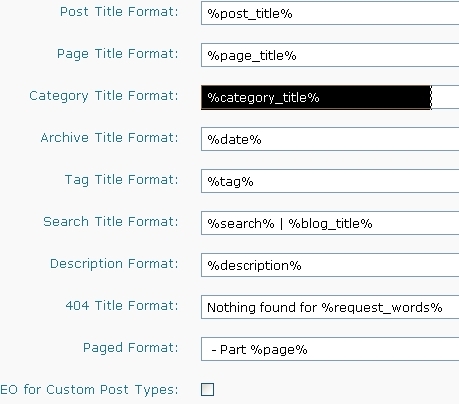 The permalink structure determines the page and post names that WordPress creates. By default WordPress uses meaningless page numbers for the page name. 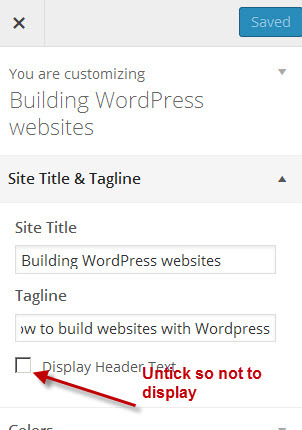 To make WordPress more SEO friendly you need to change the WordPress settings so that WordPress uses meaningful page names. Although there are several options the one I use and recommend is to use the page/post title to form the page name this you do in the Settings > Permalinks section where you change it the to use the post name only. Most WordPress themes display the Blog Title and Blog Tagline above, or with the header logo image on each page/post in the site. Again this is not SEO friendly and needs to be changed. The Site tile and tagline are set as part of the install and can be changed in the settings>general section. You could simply leave both blank, but because the site title is used elsewhere it is not the best solution. You can hack the page/post header file to remove it, but that is too technical for most,, and is not recommended. See editing WordPress Header and footer files. My preferred solution is to use a theme that allows you to remove them by simply selecting a settings option. The plugin is installed like any other plugin, and once installed you will need to enable it. The plugin has a setting page where it is enabled and configured. You will find a link to this page in the main Settings area (left column). The settings Page is too long to fit into a single image, and so I am going to take your through the settings using 4 screen shots. 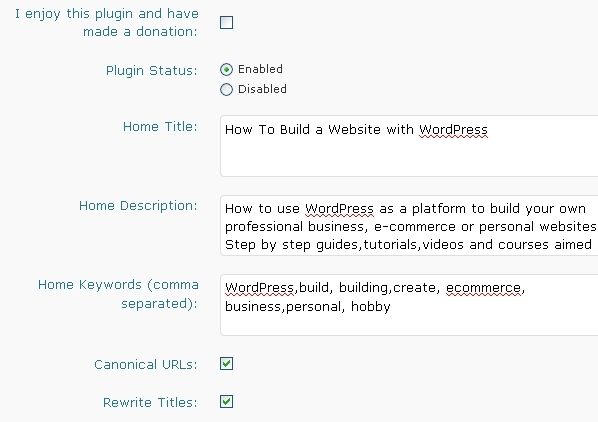 The first shows how the plugin is enabled, and the home page title and description settings. The plugin status should be enabled. The home page Title, description and keywords (optional) should all be set. The home page may be a static home page or a standard blog, and it doesn’t matter what the page is really called. This setting will override any settings that you make on the actual real page (covered later) . 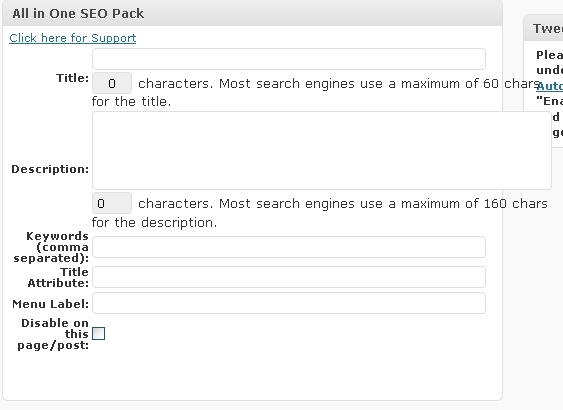 The SEO plugin is set to auto generate page titles using the rewrite titles tick box which should be enabled. (default setting). 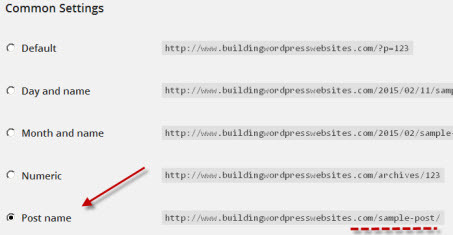 The SEO plugin should be set to use canonical URLs (default setting). The second screen shot shows how the title, description tags etc are auto generated if you don’t do them manually on each page or post. Manual editing of Page and post tiles is recommended. Notes: The post,page,category,archive,tag,search and description format have the blog title appended to them by default. These should all be edited to remove, it so that the page title is %page_title% and not the default %page_title% | %blog_title% as shown in the screen shot below. WordPress creates several method of accessing posts, and these can lead to duplicate content problems. as well as the blog home page for a time. 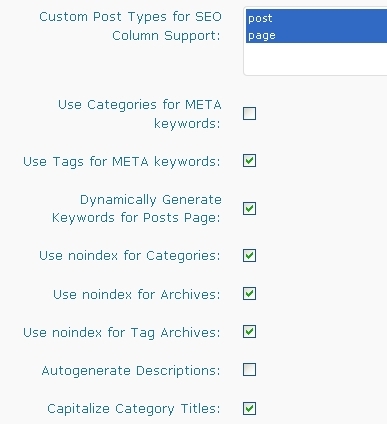 To prevent all of these pages being indexed the noindex settings for categories,tags,archives should all be enabled. If the noindex option is enabled then the SEO plugin inserts the noidex in the robots meta tag so that the search engines doesn’t index them. Note: In the screen shot above I have not enabled the auto generate descriptions but you can if you want to. Remember it is better to create your own descriptions. 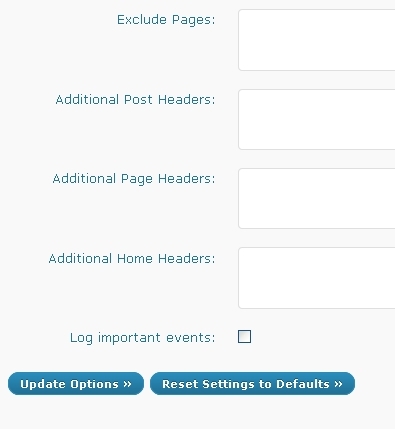 Step 4- Make Sure each Page/Post has a Unique Page Title and Description. For Small websites (<10 pages) use pages and not posts. Pages are not referenced in multiple locations like posts and so there is no danger of duplicate content with pages. Make sure that every page or post you create has a least one link pointing to it from somewhere on your site. Small sites (<25) pages tend to be flat with all pages either being linked to directly from the home page or from an articles page. Larger sites have an hierarchical structure. 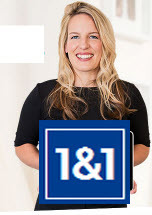 Do not create a site with more than two tiers. Any page/post on your site should be reachable from the home page by two links at the most. Creating a search engine friendly website with WordPress is easy provided you acquaint yourself with some SEO basics, and follow a few basic steps. PS Don’t forget to pass it on to your friends if you found it useful.